Dillon Waste operate a civic amenity centre at our onsite facility in The Kerries, providing an opportunity for the public to recycle and dispose of their waste. A receptacle is provided for each of the following materials. There are no disposal costs for these items once the material is deposited into each bin. Disposal of general waste by the public is charged either per bag or by weight (using our pit-mounted weighbridge system). 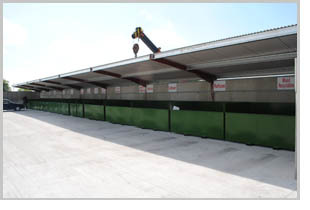 Other materials accepted at our facility are Batteries, Timber, Garden Waste and Rubble. We do not accept hazardous waste e.g. asbestos at our civic amenity centre. In recognition of this valuable facility to the local community, Tralee Tidy Towns have presented awards to Dillon Waste in 2010 and 2012.